Get to the mountain because it’s there. But you don’t need to do it alone. I suppose it sunk in when I started playing World of Warcraft, that’s when I joined a community that actually had a reason to use voice chat. We had people from Australia in the guild and I had no idea (I thought they were just night owls, as most of us were.) It’s sort of silly that I took that long to make that realization. Considering I played a Korean based MMO, Ragnarok Online, before that. The difference being it’s very easy to robotocize people online. You easily forget they are people too. This is probably why people are so rude on the internet. They don’t really make the firm connection that people on the other side are actually people. But they are; they have feelings and lives. Social network sites are a testament to that. Still, there is a certain degree of detachment that remains. It’s pretty difficult to forge real friendships across digital lines. It happens of course, but it’s not common. A lot of times these friendships fade as quickly as they are formed. When crisis hits people are hesitant to bring them to their digital clique and rightly so, they are just as likely to fade out as they are to be supportive. But that doesn’t make internet socials inherently evil. It just means that it’s a wide pool of casual acquaintances. It’s nice to have people that only really share one interest with you. That’s why these little clubs are so important. It is always nice to have people affirm your opinion and it hurts a little when people put it down. That’s what makes internet trolling so dangerous. Some people genuinely use their web presence as a way to express themselves and get social interactions beyond work and school. Devaluing this time on an individual that is using it to combat depression is a horrible thing, especially if they’re combatting bullies at school or the workplace. I can speak from personal experience on dealing with both. It is not harmless. It is not fun. It takes a lot of drive and mental strength to wake up each day and face the day with strength. If you’re tired, physically or mentally you have the urge to stay in bed. The same goes for the internet really. Enough bad experiences and the socialization decreases and degrades to computer time being lonely games of minesweeper. 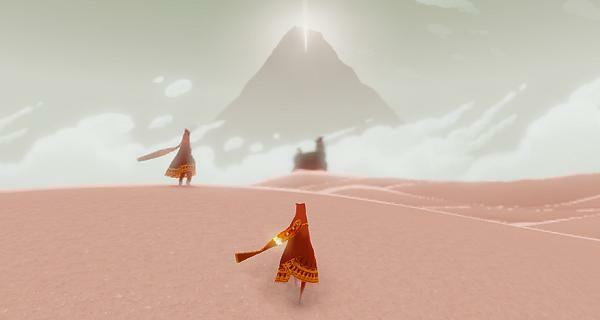 Recently I played Journey, a PS3 downloadable game that has multi-player but not in the way you’d think. If anything it makes a nice analogy on life. Sure you can get by on your own but running into another person just reminds you that you don’t need to be alone. There are people out there just like you, struggling and persevering to some degree. There are no trolls, only companions. Stop lurking folks! A voice is a voice, even a digital one; even if it’s only a monotone chime. You know, back when my family first got an internet-capable PC, my brother used to go to Yahoo! Games and harass people while they were playing Chinese Checkers. He rarely played (if ever, as far as I know) — he just took a spot as a spectator and let the “jokes” fly. So to some extent, he was something of a proto-troll. Incidentally, I think I become an even nicer person online than when I’m offline. Not to say that I’m a raging demon IRL (maybe an annoyed sheep at best), but I feel compelled to be more informative and helpful and entertaining for people I’ll likely never meet. Really, what’s the point of giving people trouble online? Isn’t it more rewarding to be nice? Anyway, another great post. And I seriously need to get my hands on Journey. But yeah, I will say exposure to internet cruelty can really strengthen your temperance. I never considered myself a powder keg, but I’ve certainly mellowed out considerably. Though that might have more to do with getting old. Ha.